From its opening fanfare in 1860, the Lahaina Courthouse served as a customs house for whaling and trade ships as well as a center for government offices and court functions during the Monarchy period. 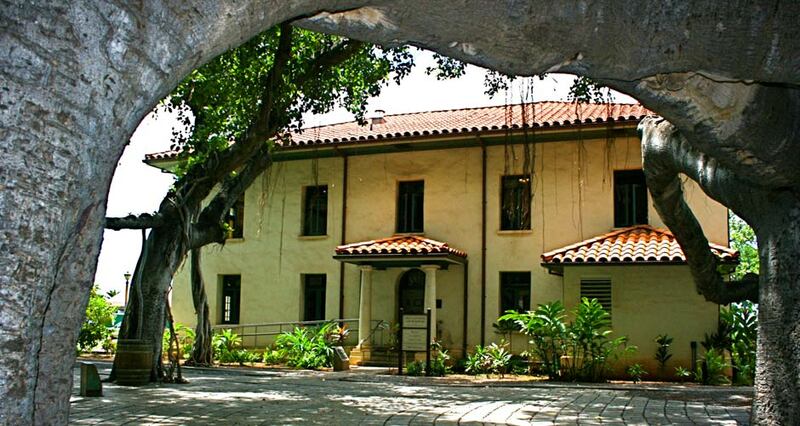 Constructed between 1858-1859 on the site of the Old Fort, “Lahaina Court & Customs House” was built with coral block and other materials that came from Kamehameha III’s unfinished western palace (Hale Piula), which was destroyed during a fierce Kauaula wind. 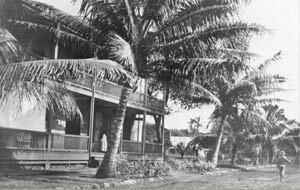 The two-story wood facade building contained a post office and collector’s office, offices for the Governor of Maui, Sheriff and District Attorney as well as a courtroom. 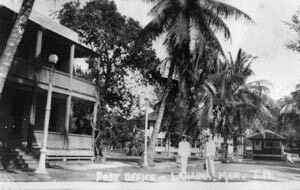 On August 12, 1898 when the Hawaiian Islands were officially annexed to the United States, Lahaina’s assistant postmaster oversaw the lowering of the red, white and blue banner of the Hawaiian Kingdom and watched the American flag being raised in its place over this courthouse. In 1925, the courthouse was rebuilt with a new gabled roof, entrance and second floor balcony in the Greek Revival architectural style that you see today. The courtroom, judge and tax collector’s office were upstairs. The post office and police station were on the first floor, and the jail was in the basement. They remained in use until the 1970s when the Lahaina Civic Center was constructed. 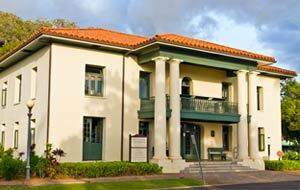 The County of Maui funded a major restoration to Old Lahaina Courthouse in 1998. Once renovations were completed, a management and maintenance agreement was executed between the County and Lahaina Restoration Foundation. The building is home to the Lahaina Visitor Center, Lahaina Arts Society galleries, and Lahaina Town Action Committee offices. In 2011-2013, NOAA and the National Marine Sanctuary Foundation worked with Lahaina Restoration Foundation to renovate and reopen the Lahaina Heritage Museum upstairs with a new comprehensive exhibit, “Always Lahaina.” They also installed displays on the Hawaiian Islands Humpback Whale National Marine Sanctuary, and built a video theater downstairs. In 1827 when seamen and whalers learned of a decree that women of the town were no longer allowed to visit their ships, they blamed Rev. William Richards. He was the first missionary to Lahaina, and exerted much influence on the members of Hawaiian royalty recently converted to Christianity who governed the town. A whaling ship captain ordered his cannon to be fired on Richards’ house in the missionary compound, and the angry whalers also hurled insults at his family. Fortunately, no one was injured when a cannonball landed in the yard. Kuhina Nui (Regent) Ka‘ahumanu, a strong supporter of Rev. Richards, decided the town needed protection and ordered that a fort be built. Maui’s Governor Hoapili oversaw the construction, which is said to have been a quadrangle covering nearly an acre. It was constructed of coral bricks and stood watch over the anchorage and canal leading to the royal complex. Subsequent visitors to Lahaina thought the fort looked more like a showpiece, saying it was mostly used to fire gun salutes on the king’s arrival and on his birthday. Torn down in the 1850s, the fort blocks were used to build the town’s first prison enclosure. A replica of the fort’s remains was built in 1960 as a set for the 1961 feature film, “The Devil at 4 O’Clock” and installed on two corners of the courthouse square in Banyan Tree Park.